What we need to explain to perspective medical assistant students is that this is just a start for them. 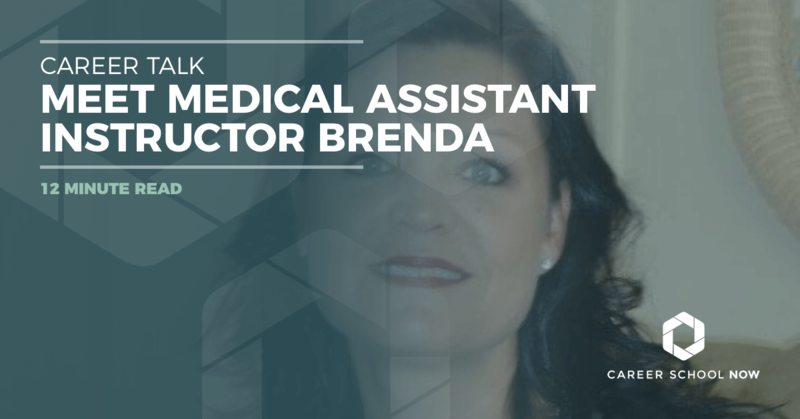 Brenda Roldan has made a fantastic career out of the medical assisting field. She practiced the trade for years, all the while moving up in ranks. Now, she advocates for the industry from her position at Rasmussen College, helping students like you get their start and come to a great finish. Read what she has to say about becoming a medical assistant. I stress to my students that medical assisting is not a stepping stone to being a nurse. No. Medical assisting is a career all on its own. And you need to enter it with the frame of mind that you are building a career, and a potentially great one. WHAT MADE YOU DECIDE ON MEDICAL ASSISTING AS A CAREER? I've been in the medical field since I turned 16, pretty much my entire work career. I was working in a nursing home as a nursing assistant and had done that for about 10 years. I started thinking about what I was going to do when I was 50 years old, and I knew I couldn’t do nursing assistant work at that age. I had no formal education other than high school, and so I decided I needed to learn more and do more. I entered into a diploma program, which I oversee now. The diploma program is where we set the students up for their certifications at the end, and then they can join the workforce. We encourage them to come back and get their associate degrees, which is what I had done. And then I went on to earn my bachelor's degree and my Master's in Public Health. That’s one of the many optional paths for my students to follow. I wholeheartedly believe in this career. I wouldn't have my master’s degree had I not gone through that first 11 month program way back in 1989. That gave me the confidence and knowledge to move on up the career ladder. YOU NEVER WENT TO COLLEGE RIGHT OUT OF HIGH SCHOOL; YOU DID ALL THIS LATER ON IN LIFE! Oh yes, much later. I had to do it, though. I found myself as a single parent at one point and was like, I really need to do this. I'm a strong, firm believer in education. I earned my Bachelor's in Healthcare Administration. I wanted to stack all my degrees in the medical field. What we need to explain to perspective medical assistant students is that this is just a start for them. And if they choose to stay in that MA role, well, that's fine, too. But they must understand they need to add college degrees on top and move up the ladder as I've done. Just having my associate degree in an office earned me the clinical coordinator title. Whereas, people who didn't have an associate degree or a high school education weren't going to be offered this type of position. When I'm teaching my students, I tell them that this is great; this is going to get you into the workforce, but you aren't going to want to stay at that level. You're going to need to do more to get more. Many programs are only 11 months, and the students can go out with their diplomas and earn roughly $32K per year (per the Bureau of Labor Statistics) working as a MA. That salary is not bad for so many of these graduates, who were originally working at places like Burger King, McDonald’s, and even a gas station. On top of the salary, we also have to look at what the employer offers for benefits. No company anywhere is obligated to offer benefits, which is why they're called that. They offer them to keep you as a loyal employee. So you add that in. Where they were working probably offered no insurance or benefits of any sort, so it's definitely a step up in status and in the financial aspect, too. WHAT DO YOU WISH YOU KNEW THEN, WHEN YOU FIRST STARTED OUT AS A MEDICAL ASSISTANT? Students should know that they are capable of anything. I didn't go to college because I didn't think I was a very good student who could learn well. So I think it's important that I express to my students that they are capable of learning and doing anything. Some things we do really well, and some things we're going to have to work at. That's on a personal level. On a working and financial level, you need to earn a living—that's important. You work hard, and you should earn as good of a living as you possibly can. You shouldn't stay in the same realm forever and ever. If you get an opportunity, take it. WHAT IS THE EDUCATIONAL PROCESS LIKE FOR MA? The diploma program and what college you attend will determine how long your MA program is. Some schools only offer the associate degree program. Some have the diploma and the associate. Rasmussen is set up where students must do the diploma program first, pass it, and then come back for two more quarters to earn an Associate of Science in Medical Assisting. My other college did not have a diploma program, only an associate program. So, the graduates entered the workforce in two years. I guess the rationale is to get them through school and into the workforce so they can earn money. Then they can take their associate program. Since we live in a digital world, the first few courses may be online for this program. So maybe the first quarter will be spent online, and then the next quarter, students will be on campus for their hands-on clinical classes. They'll have three of those in a row, and then they have an externship where they're assigned to a facility where they'll put in the required 180 hours. They'll do two days per week working in a physician's office for around 11 weeks. We draw blood from each other, give each other injections, and practice on one another. Any diagnostic test we'd perform in an office we're simulating on each other in the laboratories at the school. It's always a good lesson when I have a skittish student because it teaches the other students how to handle skittish patients. By the time they are done with one class with me, they're a pro and no longer scared of the test. It's just a fear that needs to be overcame. WHAT PERCENTAGE OF STUDENTS GO ON TO GET THEIR ASSOCIATE'S DEGREE AND BEYOND? With my encouragement and the sharing my personal testimony with my students, the numbers at my campus have gone up. I don't have an exact statistic, but I do know that a great many diploma students come back for their associate degrees. Medical assistants, and society as well, need to know that the possibilities are endless with what you can do with this career if you're just starting out in it. Absolutely endless. WHAT ARE SOME PROBLEMS A POTENTIAL CMA SHOULD BE AWARE OF WHEN ENTERING THE FIELD? If they are going into the diploma program, they need to know it's programmatic so the classes are in sequence. It's not a part-time program where you can just get away with taking one class. You're going to take three classes per quarter for 11 months if you came in with no transfer credits. It's not crammed, and it's not jammed: It's 11 week quarters, as are most programs. Students need to stay on top of their work. Once you start falling behind, it's hard to keep up. Time management seems to be one of the biggest issues college students have. Learning how to delegate time. Homework time, study time, everything else time. Usually by the first or second quarter you'll get the hang of it. We even see this with adults, even older reentry adults. They complain they just can’t find the time to study, and I say you will find the time; you just have to decide to make it. So, we help our students create a time management schedule when they first start at our school. We tell them they need to be doing about eight hours of homework per X amount of days. I talk to my students personally, asking them when they plan on studying. I know some of them work odd hours and night shifts, and I help them figure out how to carve out the time based on what works best for them and their schedules. I always tell people if college degrees were so simple, then everyone would have one. Put the work in, put the effort in, and get the reward at the end. Once you hold that diploma in your hand, no one can take it away. WHAT ARE SOME THINGS A STUDENT SHOULD CONSIDER WHEN PICKING OUT A SCHOOL? The school must be accredited. And look at schools that are regionally accredited, not just nationally. Because regionally means you can pick up your credits and move them if you need to. Or, if you're finished but want to further your education, then some of those credits may apply to the new school. With nationally accredited schools, that's not going to happen. So accreditation, I'd say, is very important. WHAT DOES A MEDICAL ASSISTANT CAREER PATH LOOK LIKE? An associate degree can open up more doors, such as a supervisory role, within certain practices. It can also mean higher earnings than someone without that degree. But we need to circle back around and add that you really need that bachelor's degree, as well. If a medical assistant has a bachelor’s degree, he or she now has opened up opportunities to be an office manager. That type of position comes with $20K more per year in salary. It's significant. What medical assistants need to understand—and this is how I sell it when I'm talking to prospective students—is if you want to teach in a diploma program, the rules say that you only need one degree higher and three years experience, and you can teach. So, if I get an MA with an associate degree who's been working steadily in the field for three years, I can hire him or her to teach my diploma program. And a bachelor's degree can teach an associate program. One thing I want to be very clear on, and I am, is that I'm very territorial over my career. I could've been a nurse with my eyes closed. We work in a lot of the same environments. And, we do most of the same duties and have the same skills. But I didn't want to be a nurse. My career was as a medical assistant, and I didn't work nights, weekends, or holidays like you would if you worked in a hospital. I could go home to my children and family and have dinner with them every night. It's a 9-5 job. It's office hours, which are 8-5. Some do choose to become a nurse because they want the money. So I tell them if that's their frame of mind, then I can't deter them. For me, it should start out with passion and lead to the fact that you're laying out the foundation to build something for your future. I graduated in 1990, and medical assistants had been around for a long time. If you look at the the American Association of Medical Assistants (AAMA), it began in the 1960s by a single female. We've been around, but society is so one-way thinking … oh, you're a nurse? No, I'm not a nurse; I'm a medical assistant. I've been fighting the fight about being a medical assistant. Here's what people don't seem to always understand. When you go to the doctor's office, you think it's a nurse who's taking your vitals and such. Well, nurses don't draw blood; it's not even in their program. It's not a scope of their practice. So, they don't learn it in their program. They may learn it out in the field if someone teaches them at their job, and they perform that duty. But, they don't learn it; it's not part of their curriculum. Not an LPN or an RN. It’s a medical assistant that does that. When I worked in an urgent care center, I was the one teaching the nurses how to draw blood. Running IVs are not a scope practice of a medical assistant; however, we draw blood. If you can find a vein, you can start an IV. You just have to know how to use that equipment. Medical assistants are taught how to handle the front end (the clerical), as well as the back end or the clinical. So, we're cross trained. At any given moment, we can call the insurance company to get an approval or referral, and then wash our hands and we're drawing blood or giving an injection. We have to calculate dosages. We could potentially kill somebody if we don't do it correctly. So again, the nursing career versus the medical assisting careers—we are doing some of the same skills, and sometimes in the same environment, just a little different. EVEN IF SOMEONE DIDN'T WANT TO MOVE ALONG THE CAREER LADDER AND WAS PERFECTLY HAPPY AS A MEDICAL ASSISTANT, WOULD YOU CONSIDER IT TO BE A GOOD CAREER? I've worked with a lot of women whose spouse made a really good living, so together they were happy and satisfied. If that works for you, then absolutely. It's a great career. It's nice to have no nights, weekends, or holidays. You get to plan vacations. And just like any other company, after a year, you get two weeks of paid vacation, paid time off, and many benefits. So yeah, if that's where they're happy, then great. But then you see some of these MAs sitting around complaining that they need more money. Or, they aren't happy where they are. Well, then move. Do something about it. Unless you're going to do something about it, you're not allowed to complain. Students always ask me how much money they're going to make. And I tell them it depends on them, where they work, and how hard they’re willing to work and climb. But you have to remember that no matter where you graduate from, you're not going to start at the top. You're going to school for 11 months: You're not going to come out earning $600K. MEDICAL ASSISTING VS. NURSING, WHAT'S IT LIKE? To be a medical assistant versus going into nursing career: Nurses have a great career, and I respect them. In the medical field, we have a lot of sayings. One popular one is “treat 'em and street 'em." You don't want to keep someone in the hospital very long, because it's pretty expensive. And when they get out of the hospital, they see a specialist, and then they may not see them again until they need another hospital stay. If the nurses only work on one floor all the time, then what are they learning? They aren't learning the disease process anymore. It kind of stopped after school. In a physician's office, most medical assistants see the disease process. We see a patient that comes in and is about to be diagnosed with hypothyroidism. They come in, and they're sluggish, tired, their voice is abnormally low, it's a female and she has facial hair, so the doctor orders me to draw some blood. So, we draw blood to check the TSH (thyroid stimulating hormones). Then we get a blood result back, and the physician sees that. We give the patient some medication like Synthroid, and then they come back two weeks later and have their blood drawn again, and maybe they need a higher dose of medication, and then they start to balance out. That's called the disease process; we learn about and see that as medical assistants. And then, most importantly, is the continuity of care. Some of these patients become like family. They give me gifts at Christmas; they know my children’s names. I've attended the passing of their spouse—that's the continuity of care. We take care of these patients for years and years. It's all about our wants, needs, and desires, but for me, the medical assisting career holds as many promises as I'm willing to make. And the possibilities are endless. My advice to all college students: Stay the course and hold the vision of walking across the graduating stage, to receive your diploma. Brenda Roldan graduated the medical assisting diploma program in 1990 from Wooster Business College in Cleveland, Ohio. She successfully worked in the field as a medical assistant until 2005, when she began her academic career. During that time, she completed her MA-AS, HCA-BS, and a Master’s in Public Health. In addition to classroom instruction, Brenda has held a program managers position, overseeing multiple Allied Health programs and curriculum. Presently, Ms. Roldan is the medical assisting program coordinator at Rasmussen College in Ft. Myers, Florida. She has four children and two grandchildren. Brenda is a practicing vegetarian and enjoys gardening. To learn more about medical assisting, please read our medical assisting career guide.